This circuit is a simple preamplifier, audio limiter and five section low pass filter based on easily available components. The input circuit offers a high impedance that is compatible with crystal microphones and the preamplifier gain is adjustable to cater for different types of microphone. Maximum sensitivity is 2mV for onset of limiting. 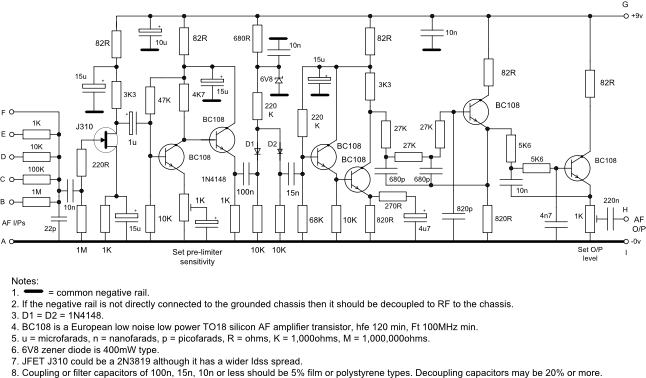 If a low impedance microphone like a moving coil or electret type is to be used then the JFET may be replaced with a bipolar device and the appropriate biasing components - the electret will require a DC supply via a load resistor of about 4K7ohms. To provide a more predictable form of operation this circuit should be preceded by a VOGAD so that the amount of limiting may be defined more precisely. In this case the input preamplifier will not be required and the diode limiter may be directly driven by the VOGAD circuit shown here on this site (Solid State Circuits 14). The VOGAD output should be set so that normal speech is 3-6dB over the speech processor limiting threshold.